An alpha version of Blizzard's upcoming MOBA, Heroes of the Storm, launched a few days ago, giving everyone with access a chance to try the game out in early development. 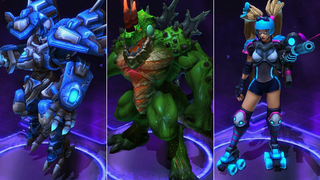 And while many of the playable heroes of the Blizzard universe have not been added yet, a great deal of cosmetic skins are already available. Glam Rock Tauren Chieftan, approved by Mötley Crüe. Just be careful with that razor blade.